Gen Con 2013 is in the books and it definitely lived up to its billing of “The Best 4 Days of Gaming.” I had an absolute blast and am counting down the days until next year’s extravaganza. But before we file this one away for the year, I figured I should take a quick look back at some of the highlights and lowlights. To make the recap a little bit more solid, I’ve enlisted the help of two fellow gamers I went to the con with. Alex and Steph are long-time gaming veterans and I hope this won’t be the last you’ll see of their writings here on Board Game Quest. One of the best things about Gen Con: free game demos everywhere! Tony: Cool Stuff Inc. – One of my annual stops each year is the Cool Stuff Inc. Booth. Every year they have a smorgasbord of great games at the their usual competitive prices. Some years you can pick up a “well loved” copy from their “Ding and Dent” section at an even better price. I pored over their booth on Thursday trying to find games on my wish list. Their booth did feel slightly smaller this year, but I was able to find a couple games at a good price. Kudos to CSI for making the booth a worthy stop again this year. Alex: Demos everywhere – I love being able to play a game before I buy it, as I hate getting burned by a purchase. 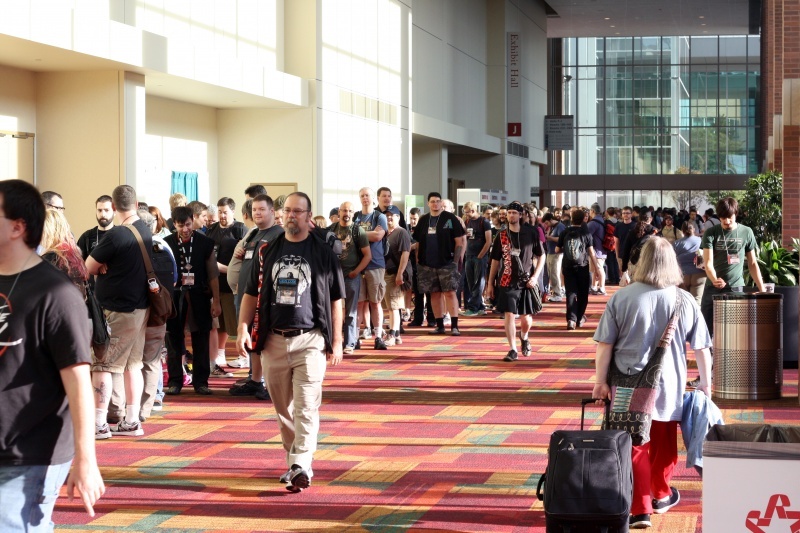 Gen Con again provides companies with the opportunity to showcase their games, interact with their customers, and give a taste of what the game is all about to prospective buyers. While I definitely frequent the big companies, I love hitting up the smaller publishers, as the game designer is usually around demoing and discussing their creation. I find those are the best experiences I have demoing, as the designers are able to let their passion and enthusiasm show, and you get some insight into how the game evolved into its final form. Steph: Demos – Being able to walk up to a booth, try a game for free, then decide whether or not to purchase it? It’s always the best part of the con. When Alex orders games sight-unseen, I get nervous. Is our money well spent? What if I don’t like the game? There’s no risk at Gen Con. If I don’t like a demo, I just say thanks and walk away. I know within two rounds if this is a game I want to buy. We had the hardest time trying to get a demo of Firefly. Tony: Trying to demo hot, new releases –Trying to get a demo of the new Firefly game was just painful. I heard the same about the Pathfinder game. Some were hard to demo because of high demand, yet scarcity of tables. Others were because the publishers were letting people play full, 45-minute games. The first point is excusable: space is limited and demand is out of a publishers control. But the second shouldn’t happen. 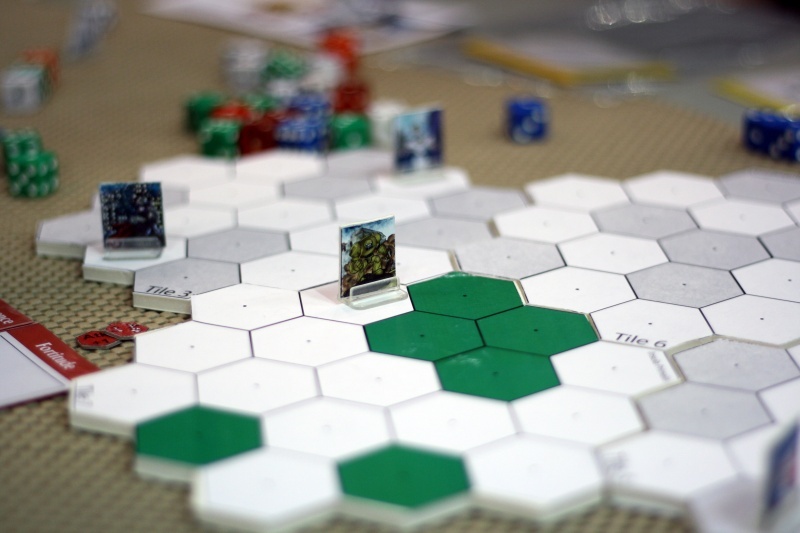 When you demo a game at a con, it should be to play a few rounds so you can get a feel if you like the game or not. After 10-20 minutes you should know if this is your type of game or not. Unless the booth is super slow, there is no reason to keep other people waiting by playing the full game. Alex: Game booth workers – In the past, I usually have good experiences with the booth workers at Gen Con. This year, I think all my good karma ran out. At three different booths I asked to run through a demo of a game and I was told that they didn’t know the rules and that they could just give me a sales pitch. Sorry, that’s not going to get my business. At another booth, I got a quick explanation of the rules of a game, then the worker disappeared before my group had a chance to ask any questions. We left the demo (and not our money). I dealt with even more disinterested and disaffected demos this year compared to last year, and I’m also with Tony that many of the demo workers weren’t engaged enough. Note to game companies: I want to try your games and give you money – make sure you have staff on hand that can put me in a position to do both! Steph: Booth babes – What does a well-endowed woman in a tight outfit have to do with a board game? Nothing. It doesn’t tell me about your game. It doesn’t help me learn the rules. It’s a cheap ploy to bring (certain) men into booths. It clogs up the aisles and continues with the stereotype that gaming is for men. Hello! Double-X chromosome here. I game. I do not want to see booth babes or their male counterparts. It demeans women in general and female gamers as well. Genius by Fantasy Flight Games to allow reservation tickets to get their new releases. 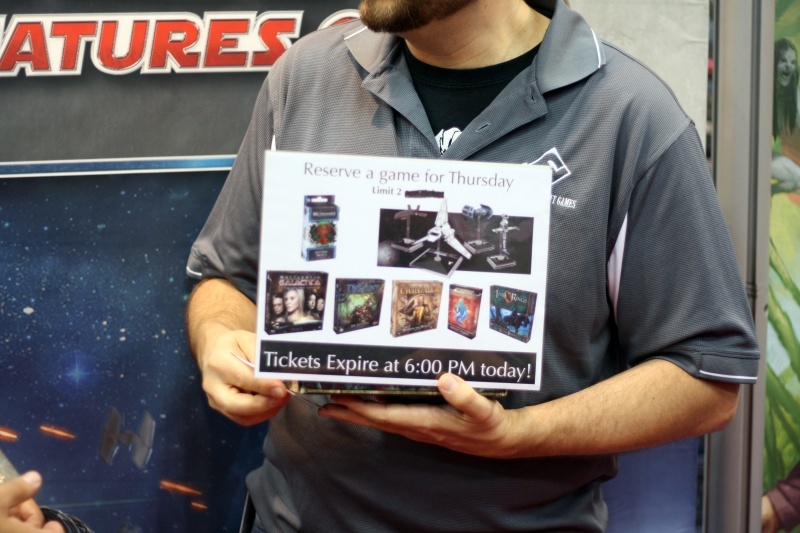 Tony: Fantasy Flight Games Tickets – FFG usually has a mad rush at the opening of the hall for people to get their latest releases. However, this year they tried something new. 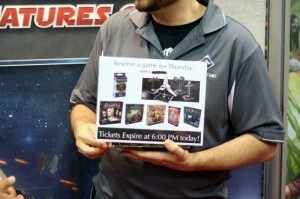 You could claim a purchase ticket early in the day and comeback later to buy your games anytime before the hall closed. This is a fantastic way to avoid having to stand in line for what could be hours of your day. Kudos to FFG for this great idea. Alex: Scheduled demos – I really wanted to try out Marvel Legendary in the dealer hall, and I was not surprised that there was a wait for the demo table. However, being able to leave my name, gaming group size, and cell phone number, then getting a text when my demo table opened up? Brilliant. This saved me time standing around waiting for the line of would-be demo players to shrink. Some of the companies with the more popular games to demo (I’m looking at you, Firefly Board Game) would be smart to adopt this model in the future. Steph: Cushioned flooring – I know this sounds so trivial, but many more booths had cushioned padding on their floor space. As someone with foot problems, I appreciate the attention to detail. Stepping off of the concrete aisle and onto a springy mat in a booth instantly uplifts my mood. Better mood = better chance of me making a purchase. Well done. Despite setting a record number for attendees, the crowds in the dealer hall were very manageable. Tony: Wizards of the Coast Missing and Lords of Waterdeep – I probably shouldn’t be too surprised by this one as their booth last year was mostly a waste of space. But I felt WOTC was missing from the hall this year as they have moved their presence to one of the adjoining game rooms. I suppose being in-between editions of DnD meant they didn’t have a whole lot to sell. What was the most surprising was their decision to not sell the Lords of Waterdeep Expansion at Gen Con. They choose instead to hold it for the Tuesday after the con. Why they would not want the chance to sell directly to 40k+ gamers is beyond me. Alex: Crowds – To me, it did not seem as crowded in the dealer hall as in years past. Yes, there was the mad rush at the beginning when the dealer hall opened, but we were able to sit down and get into booth demos pretty much all the time, especially on Saturday, which is traditionally the most crowded day of the convention. Clearly, my perception must be skewed since attendance was in the 49,000+ range, but maybe the organizers did a more effective job in organizing the booths for traffic flow. Steph: Saturday – Saturday in the hall is usually PACKED. Wall-to-wall people. From the moment the hall opens, you can’t walk without having to push through people. For whatever reason, the crowds on Saturday were manageable. Aisles were passable, booths had room for comfort. Not sure what contributed to this. 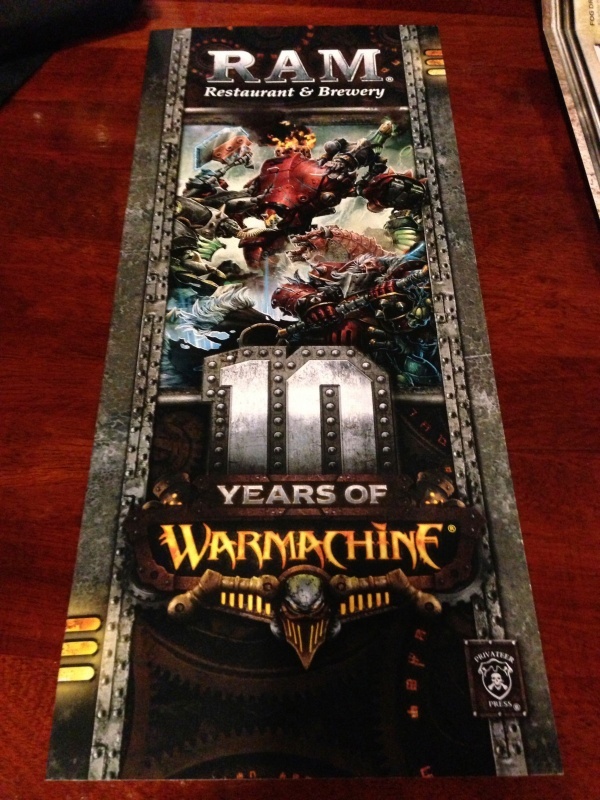 It seems like every year, FFG wows the crowd with a new game release…except this year. Come on FFG, we’ve come to expect more! Tony: Fantasy Flight Games –The new releases from FFG this year felt a little weak. They were all expansions to existing games. Don’t get me wrong, the new X-Wing minis look great, but FFG was missing that hot new title that everyone looks to grab each year. 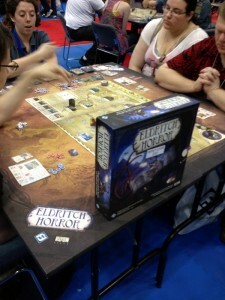 I went to the FFG booth, saw the new releases and was decidedly underwhelmed. No new titles, no Eldrtich Horror (although you could demo it). This felt like a big miss for me. 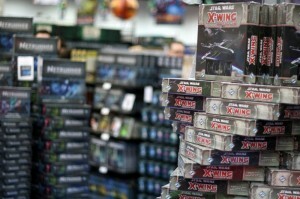 Alex: Fantasy Flight Games – I’m with Tony on this. It seemed to me that the new releases at Gen Con this year were either expansions (Descent, Netrunner, Star Wars RPG, Game of Thrones) or reboots (BattleLore 2.0). Surprising that they didn’t have any new titles for sale. Also worth mentioning is how they managed their sales space. While I fully experienced the horror that was the Netrunner release last year, and would hate to see the 2-hour lines appear again (although that should be mitigated by the purchase ticket strategy), there needs to be a better way of managing your space by forcing people to wait in line just to get into the retail space, then to wait in another line to make a purchase. As the biggest games company on the floor, they can afford to be innovative: give your workers an iPhone with a reader, to work the line for people making small purchases or adding another register are a few ideas. Steph: Mobile Phone Apps – Where were the mobile phone apps? I do not want to lug around the huge paper program. First of all, it’s a waste of paper. Secondly, a mobile app can be updated to reflect ongoing changes. I would love to have a map of the convention center, dealer hall, and other hotels right on my phone. Why they didn’t update their app from last year is beyond me. And note to Gen Con organizers: that app didn’t work well even when you had it. We all had a blast playing Rampage. This is the game I wanted King of Tokyo to be! 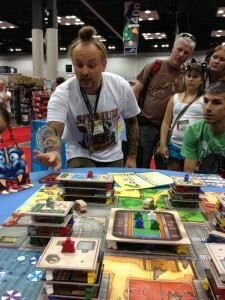 Tony: Rampage by Asmodee – I got to demo a giant version of Rampage at the convention and can’t wait to buy it. 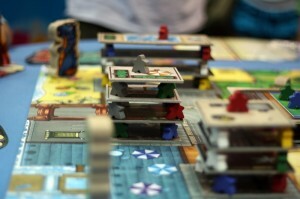 It’s a fun dexterity game where everyone plays a monster trying to destroy the city and eat meeples. This is the game I was hoping King of Tokyo would be. I can’t wait to get a copy of Rampage this fall. Alex: Damage Report by Break from Reality Games – I played a few games at Gen Con that had a real-time simultaneous action mechanic, but this cooperative game piqued my interest. You take the role of a crew on a module-based ship that is facing a crisis which gets worse as time passes. In order to combat the crisis, you have to pick up components from various parts of the ship and deliver them to the areas to complete repair actions. Depending on the state of your ship, the amount of time between each of your actions (measured with a 15 second sand timer) can fluctuate between 15-60 seconds, which has marked effects on your ability to solve the scenario. We found the gameplay to be engaging, straightforward, frenetic and exciting, and look forward to this release. The game is currently in production, according to the fellow we chatted with, and should be released during Q4 this year. Steph: Rampage by Asmodee – Hands down, my favorite. Playing as a rampaging T-Rex-ish monster was a blast! How often do you get rewarded for dropping pieces on a board game or knocking over meeples? Never. I cannot wait to purchase this game and introduce it to our gaming group. 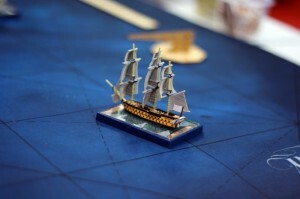 Sails of Glory was a blast to play and the miniatures looked fantastic. Tony: Sails of Glory – I backed this one when the campaign was running and I finally got a chance to try it at the convention. I had a ton of fun. We just used the basic rules, but even then we had some good sailing ship carnage. We were easily able to wrap our heads around the simple ruleset and by turn two, were making decisions on our own. Plus, the components look just fantastic. Keep an eye out for this one next month. Alex: Galaxy Defenders – I’m not much of a Kickstarter, but I did get on board with this game, and from the looks of the components, I will not be disappointed. I was sad that they didn’t have any demos running, and that it was only a display copy, but I was blown away by the look and feel of the game, even though I did not back it at a high enough level to get metal miniatures. That said, I think my paintbrushes will be working overtime to get these guys looking really sharp, and I can’t wait to get this one in the mail. Steph: n/a – I confess, I do not follow Kickstarter games at all. That’s Alex’s thing and he keeps me updated on any games we’re supporting. It looks like Greater Than Games has another hit on their hands with the Sentinels of the Multiverse Board Game. Tony: Sentinels of the Multiverse Board Game – Announced shortly before the convention, they had a playable prototype there. The components were just filler material, but the game play itself was a ton of fun. I love the card game and I was immediately interested in trying out their board game version. If the final product is anything like the prototype, this will be an instabuy for me. Alex: Impulse by Asmadi Games – I’m a fan of Carl Chudyk (Innovation, Glory to Rome, Uchromia) so it’s no surprise that I really enjoyed this game. 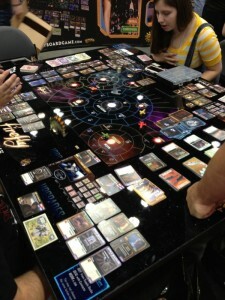 Designed as a card-based 4x space conquest game, it is definitely relevant to my interests. Combine that with quick setup, strategy that is subtly deep, and the ability to string together ridiculously long and obnoxious turns (my wife’s favorite) and this is a release I can’t wait to pick up when it finally hits production. Steph: Sentinels of the Multiverse Board Game – SOTM card game is one of my absolute favorites and the board game prototype did not disappoint. Even without any of the artwork or components on display, the mechanics worked well and the gameplay flowed easily. It fondly reminded me of Hero Clix. This will be ordered as soon as it’s available. Asmodee’s booth people were as friendly and informative as always. If you’ve never had Gil demo a game for you, you are missing out on a great experience! Tony: Iello – I spent a lot of time talking with publishers, both from a media standpoint and as a general gamer, and I had the best time at the IELLO booth. They were just friendly and very approachable all around. As a gamer, it was easy to get a demo at their tables, their staff were all very knowledgeable and they even had a bunch of convention promos you could get. From a media perspective, their people were very accessible and provided me with a lot of insight on their current lineup of games and up-and-coming titles. Look here in the coming days for more information on new products from IELLO. Alex: Asmodee – I spent a good bit of time at the Asmodee booth, and find that they always provide an engaging climate. They have some of the friendliest and most enthusiastic demo staff on the dealer floor (if you haven’t had a demo run by Gil, you don’t know what you’re missing) and always have a novel demo year-in and year-out. This year, the giant versions of Rampage and Takenoko were both well worth the experience, and they give you the time to run through a good chunk of a game to decide whether it’s worth your time. They remain a must-stop early on at the convention for me. Steph: Asmodee – How do I love thee? Let me count the ways. Enthusiastic, engaging booth workers to demo games. (I could really stop there. I cannot stress enough how important it is to have skillful demo-ers. If I am not impressed, engaged, or enthused by your demo, I am not giving you my money. Most companies need to take lessons from Asmodee on how to demo games.) Colorful, fun components. Great artwork. French accents. Gil. If you have not had a demo run by Gil, you are missing out. 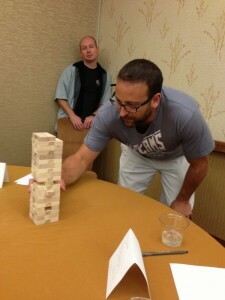 Whether in the convention center or in hotel lobbys, you will find pick up games EVERYWHERE at Gen Con. 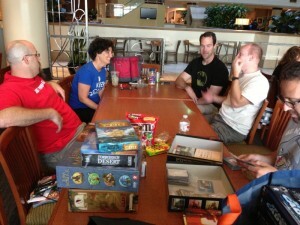 Tony: Gaming everywhere – I love the fact that you can game 24/7 at Gen Con. We walked through the convention center after midnight and there was still a ton of gaming going on. I swear, some of these people don’t sleep for 4 days. Gen Con is the best place to try a new game out that you’ve never played. I assure you, you have a great chance of finding someone running it at some point. Alex: Random gaming – I love meeting new people and gaming with new people, so long as I don’t think my ears are going to decorate your doorstop. This year, I got stopped by a group, ages between 10 and 50, outside the elevator bank in my hotel, asking everyone who passed if they wanted to join their game of Werewolf. It was midnight, my feet were killing me, I was exhausted, and a group of random people wanted to game with me? I was so in, if only for a few rounds. Gen Con is a celebration of gaming, and it unites our community, and as long as I don’t think you’re going to turn me into a lampshade, I’m more than happy to game with you. Steph: All day gaming – Coming home is such a disappointment. On post-con Monday, I was in a large room in a workshop with about 60 other people. Why weren’t we rolling dice? Why weren’t we flipping through game rules? Gen Con spoils you. For 12+ hours a day, you are gaming with friends or total strangers, having a blast. Come on people, act like adults and mind your manners! Tony: Bathrooms – After day one, you don’t even want to go in those. Yuck. Alex: Taking pictures of cosplayers – You want to take a picture of a cosplayer? Fine. Please don’t stop in the middle of an aisle to do so. You are taking a picture of a cosplayer from across an aisle? Fine. Don’t get annoyed at me when I don’t notice and walk right through your picture. Steph: Hygiene – Really? We’re all (mostly) adults here. I have to tell you to take a shower, use soap, and apply deodorant? We know that there are going to be tens of thousands of gamers in close quarters. Please be considerate, take at least five minutes and clean yourself. Additionally, do not sneeze/cough into your hands!!! We are all touching the same games for four days; I don’t want your germs on the demo dice. At least with this, I can use antibacterial lotion to combat the nastiness. Surprisingly the restaurants at Gen Con were both quick to serve and decked out for the attendees. Tony: Customer service and will call lines went quickly – Some years, the will call line has taken hours to get through. With their new 24 hour will call lines, it’s a breeze. Our first swing by saw a long line and decided to go have dinner first. When we got back, we were through the line in about 5 minutes. Great job to the staffers on that one. Alex: Wait time to eat – We had no wait at any of the places we hit up for dinner, including both The Ram and Scotty’s Brewhouse, traditionally two of the most gamer-friendly eating establishments. Again, maybe I’m not seeing the magic behind the curtain, but there didn’t seem to be as many crowds at these places, which made our experience that much better. Steph: Crowds in the convention center – In 2012, there were about 40,000 people. I knew there would be more this year. According to Gen Con’s Facebook page, there were 49,000 unique visitors. Surprisingly, the con did not feel that much more crowded. I was shocked on Saturday morning when the dealer hall aisles were actually navigable. Way to go, Gen Con. You rolled a 20 on your planning/organization check. Come on Reaper, we miss your giant booth of minis! Tony: Cards vs Zombies – We played this even last year and loved it. However this year, there was a distinct lack of players. This is a meta game that is played throughout the convention, but because the center is so big, if you don’t have enough players, it’s pretty boring. This year, we had a hard time even finding other players. For what was so much fun last year was a huge let down this year. 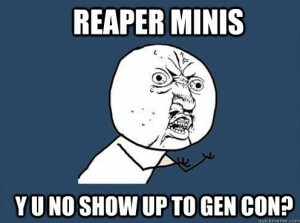 Alex: Reaper Miniatures – I understand from a business point of view Reaper didn’t attend Gen Con for the 2nd year in a row, as they are showcasing at PAX Prime again this year. 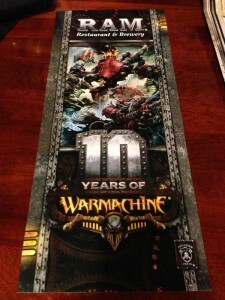 However, since I am not a fan of some of the other miniature companies in attendance, I miss seeing them. Plus, I’m always in awe of ReaperBryan’s encyclopedic memory when it comes to his miniatures, and I love watching him get all excited as he circles the racks looking for your perfect mini. 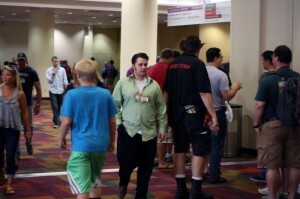 Steph: Cards vs Zombies – Last year, walking through the convention center was nerve-wracking. We walked in formation, scouting for zombies at all times. It was blast and we remained humans all four days. This year was so disappointing. I saw no zombies at all. You can’t play tag if no one is “It.” The game fell flat and even though it was only a few bucks, the game was waste of money. Our surprise hit of Gen Con. We signed up for the game on a whim and absolutely loved it! 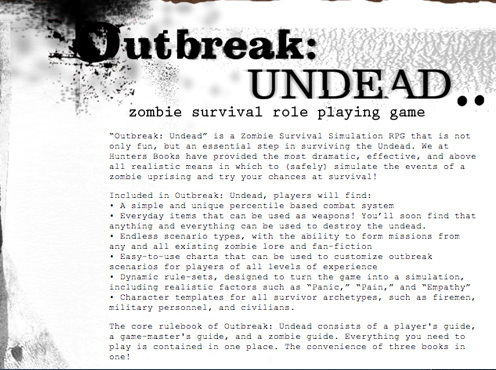 Tony: Outbreak Undead – We played this RPG for the hell of it because it sounded fun. And it was! It was an RPG where you play yourself during a zombie outbreak. Our GM did a great job or rolling with our punches and working on the fly. We are glad we checked this game out (even though we had never heard of it before). Runner Up: The Catan Big Game. It probably would have been my favorite if it wouldn’t have taken 2 hours to get setup and organized. Ugh, that was brutal. Alex: Outbreak: Undead – I’m in 100% agreement with Tony on this. Character creation that involves generating an equipment list of everything that you have on your person when you sit down at the game? Unique. Playing yourself in an RPG? Even cooler. Having a DM who can adapt on the fly to the fact that we know the layout of the ICC and the hamster tubes into the hotels? Bonus. Had an absolute blast playing this, and I’m searching for a copy of the book so I can run it for my gaming group at home. Steph: Outbreak: Undead – We all know that RPGers always play a version of themselves, but here you actually have to be you! Not only did I enjoy the mechanics and concept, but our GM was fantastic. He was engaging, funny, challenged us, and was able to modify on the fly. He adapted to his gamers to maximize our enjoyment. Notice this motif? An effective GM/game demoer makes all the difference. I had no knowledge of this game or system, yet the GM explained the rules wonderfully and kept the game running smoothly. Even though a zombie successfully attacked me and I was mercy-killed and my husband killed himself out of grief (all in game, of course), I had a blast. I was really looking forward to our game of Dread, unfortunately the environment made the event kind of weak. Tony: Dread – I love the Dread RPG and was looking forward to trying it out at Gen Con. However our table was in a small room next to a table of 14 people playing a different RPG. We could barely hear half of what our GM said. We had a fun time playing, but it was a bit of a disappointment to have the crappy conditions for the game to be run. If I could give a suggestion to Windmill Games, next time don’t schedule a huge RPG table next to a small one. Alex: The Big Catan Game – Did I have fun while playing in the record-setting largest Catan game ever? Absolutely. However, there were some major snafus with the organization that really made this a downer for me. We were not informed beforehand that seating would be randomized, which led our group being broken up, and the staff being not so nice to my wife when she asked if we could sit together. In addition, there were no checks for dishonest gamers – two people sitting across from each other near me were not-so-subtle in their attempts to break the system and win. While I had fun playing, I felt the organization really left me with a sour taste in my mouth. Steph: Dread – Let me be clear. I had a blast playing this game. But in comparison to our other events, this one didn’t measure up. Like Tony said, we were next to a large, loud table. For me, this is always a challenge since I do have some hearing loss and crowded rooms are tough.But the rest of my gaming group said they had problems hearing our GM as well. I also don’t think that our GM was tough enough. We only had two casualties: both self-sacrifices. [Side note: Alex was about to sacrifice himself for the group when Tony came flying out of nowhere, screaming, “NO, SARGE!” (Alex’s in-game name), and launched himself at the Jenga tower. The whole room (three different RPGs) stopped dead, then laughed hysterically.] I would definitely play again, as I loved the character creation mechanic and lack of stats. As someone who doesn’t feel like she’s a strong role-player, the two-page questionnaire really helped define my character. I knew who she was and played her quite well. Disappointment with Dread came down to environment. That about wraps up our 2013 Gen Con recap. Be sure to check out our photo gallery for more pictures from the convention. If you didn’t make it to Gen Con this year, I hope you can work it into your schedule next year. It’s one of our highlights of the year. I’ve heard really bad things about the Mayfair staff in general from friends who attend and exhibit at GenCon. Apparently the Mayfair staff has behaved badly enough that my friends refuse to buy anything but used Mayfair games so as not to directly support them. As for Lords of Waterdeep, I’m wondering if they realized their production stream was over committed. I know a bunch of people have been reported being put on back order for the expansion from preorders at least as early as April. That’s a shame to hear about your experience at Mayfair. When Stephanie and I demoed Downfall of Pompeii, we had a good demo leader, and ended up making a purchase based on our experience. Your mileage may vary, clearly, but your friend’s experience (and ours) really show the need for companies to make sure that all their workers are putting their best foot forward with their customers. Not just in front of customers, but also in front of conference workers and other exhibitors as well. You never know who might be a potential customer in a setting like that. Great post. I loved the format. I’m new to gaming so I didn’t really put much thought towards GenCon but it’s definitely on my calendar for next year! If you’re into board gaming (clearly, since you’re here), Gen Con is not to be missed. We’ll see you there next year! Thanks for picking up Bruges for me, Tony. I wish I could have gone, but I WILL go next year! Also, my shipment of Trains arrived yesterday, so I’ve got some new titles to bring to my Chicago gaming group meetup on Saturday. Game on! It sounds amazing and I want you to know, I’m officially jealous of you all. I’m glad you got to try out the Sentinels Tactics prototype! It was tons of fun. From what I understand from the creators, the game will be kickstarted. No official date yet, but I heard talk of it being put on kickstarter early 2014.